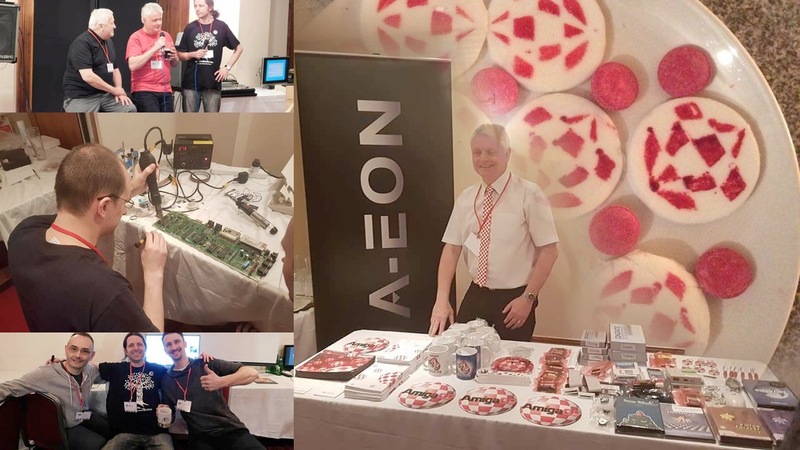 Amitopia was at Amiga32, A-EON was there, MorphOS Team was there, Hyperion was there and the Vampire Team was there. 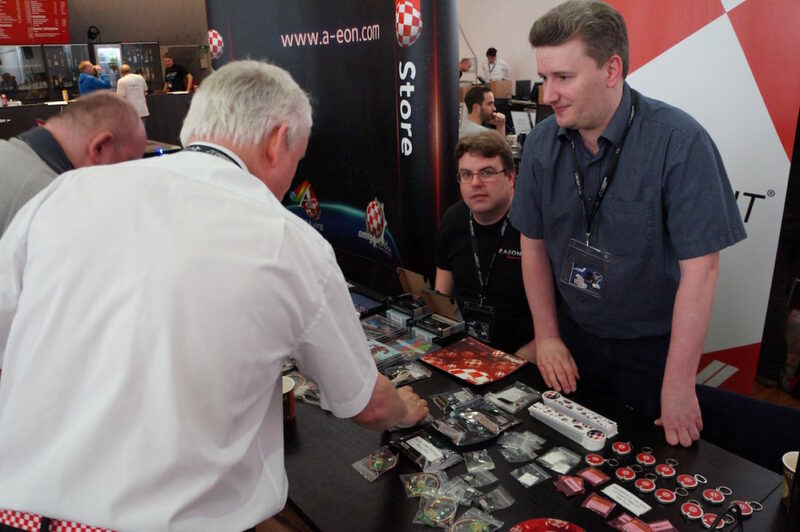 My brilliant sponsors at Amedia Computer France had a huge stand which Amitopia had a small area of, Alinea Computer, Amigakit and other Amiga supporters was also at the event. 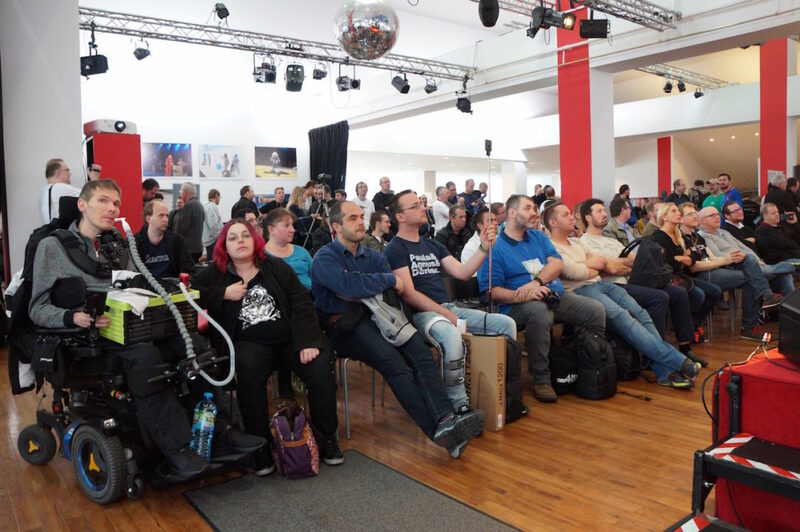 Crowded at Amiga32! There was people everywhere. 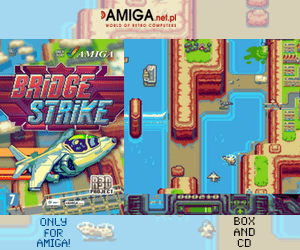 Amiga is for sure back! 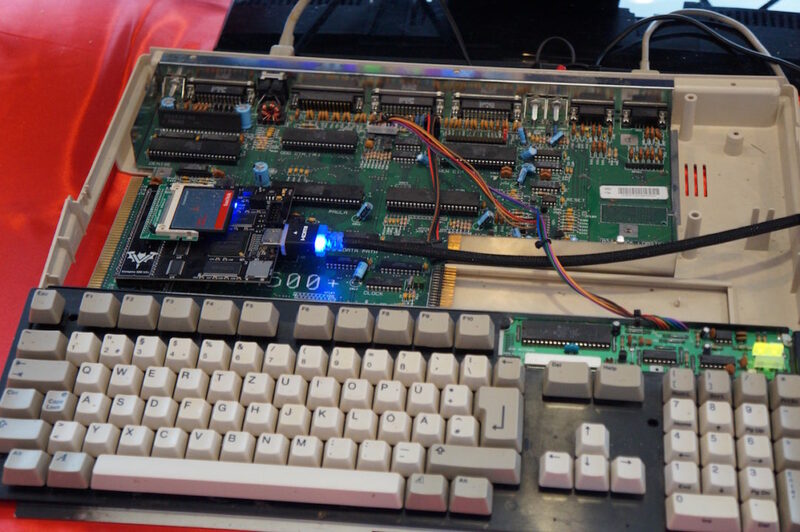 The legendary musician behind Turrican, Quik and Silva etc+++ gave the Amiga32 for sure a lift. Especially when he played together with Blue Metal Rose at the stage. Amazing! 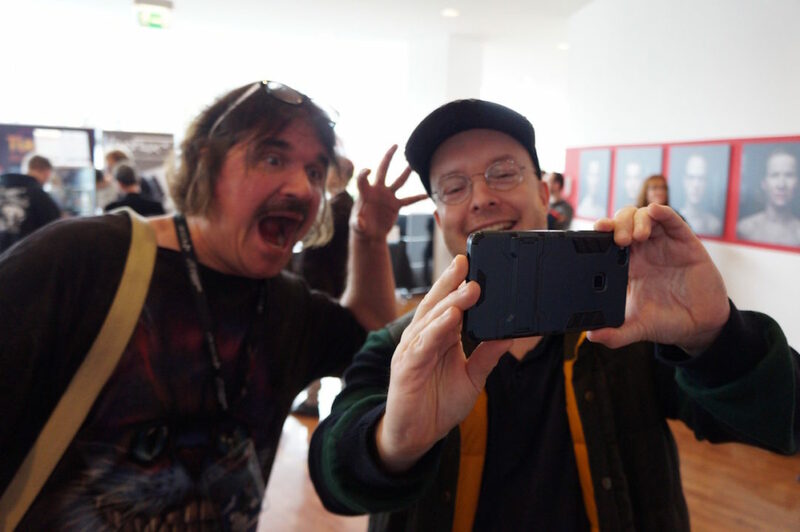 Jeff Porter, which is the man that is behind the humongous popular Amiga 500 at Commodore back in the days was there (which was amazed about the Vampire for the Amiga 500). Also, the legend Dave Haynie that did work on the AAA+ chipset was there from USA (which is fantastic at singing by the way!…). 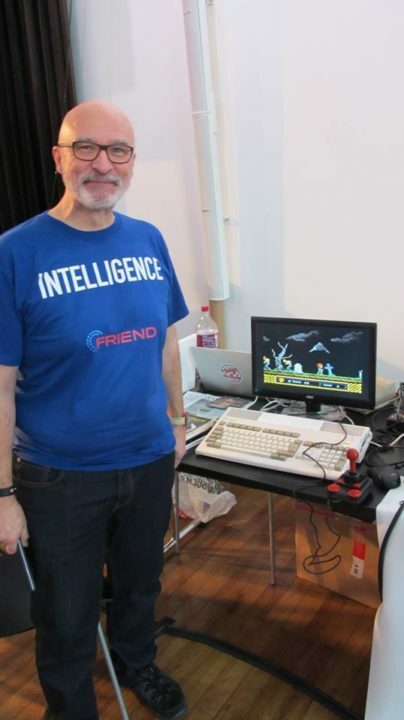 Trevor Dickinson was also there aswell with his positive personality and also David Pleasance came to the event, which was the former CEO of Commodore UK. 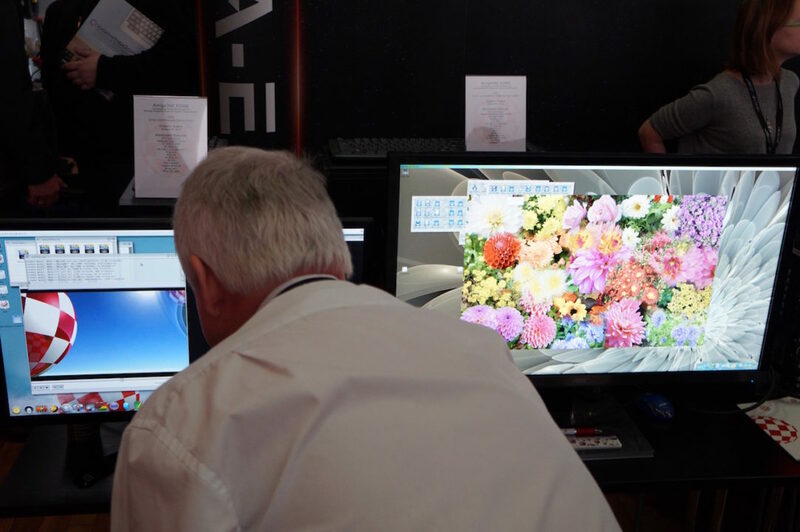 Timothy de Groote from Hyperion was also there. 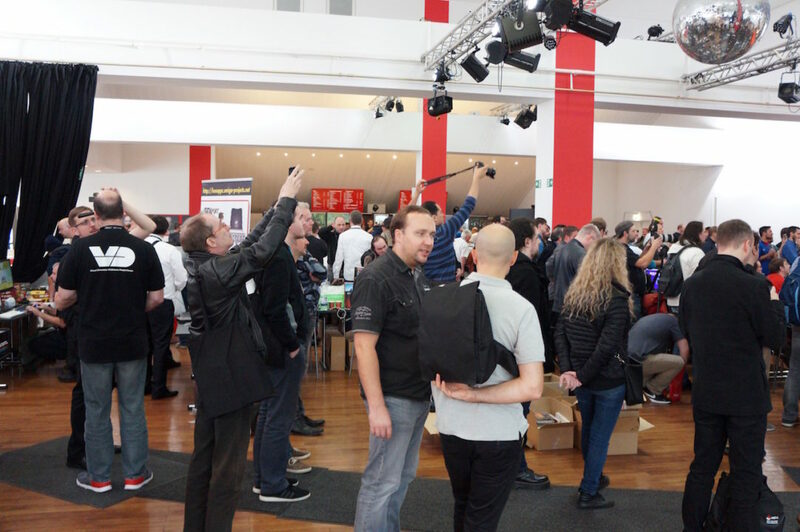 Ravi Abbott from The Retro Hour Podcast was also there and Tomasz Marcinkowski from Poland which I know was there too. photosource: Distrita – Blue Metal Rose with Dave Haynie in the middle. Couldn’t be a better picture for sure! The awesome Chris Hüelsbeck (which also knows magic! ), amazing Patrick Nevian and the lovely Alice Schmidt had a amazing performance. Alice’s voice is strong and powerful. It touched me a lot to see her sing at the stage even though it’s been a year since she did performance she told me. She said that she was nervous at the stage, but I think that she did a fantastic performance. Blue Metal Rose is for sure a pop band that got this gothic singing elements that gives it the extra edge. I loved the Why Anna performance! They did a fantastic job at the stage. Blue Metal Rose produces powerful synth music, but also the vocals is what makes it all perfect. Thanks so much! 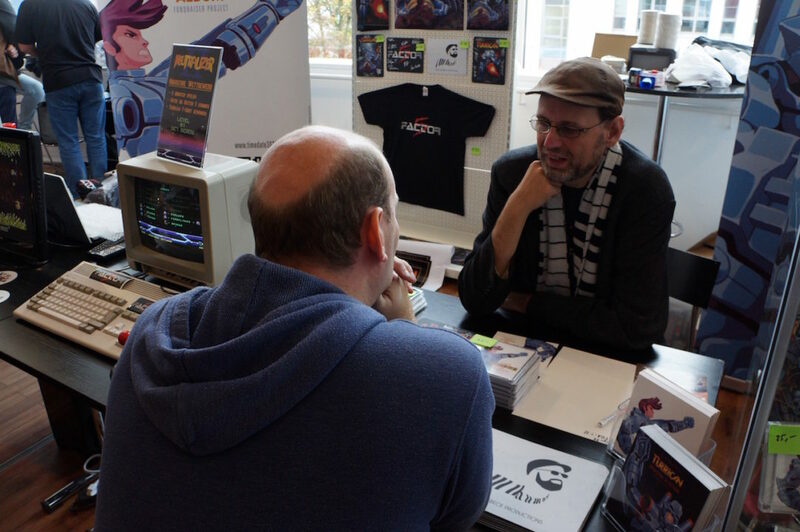 Richard Löwenstein with his Reshoot R game was also at Amiga32 event. 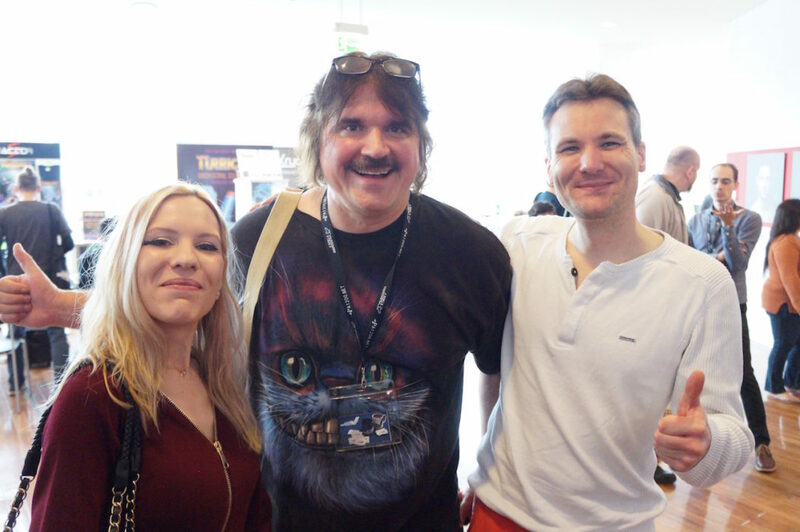 He demonstrated the game for me and I explained to him how nice the moving worms that he had created and he reported to me back that I was the very first to comment about them to him at the event. I was moved by it for sure! Reshoot R is for sure a big upgrade from the previous Reshoot game. It got all the action from the original Reshoot game, but also have added weapons and the game itself feels easier to play. It will for sure boost some sales that this developer deserves. This is a nice shooter! I loved it! The Vampire stand was full of people always. 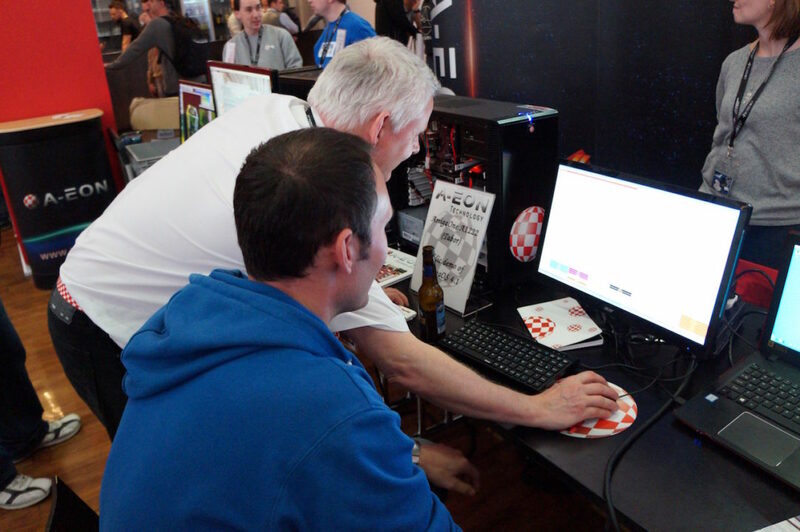 Especially when Jeff Porter, which is the maker of Amiga 500 saw what the Vampire 500 v2 could produce. 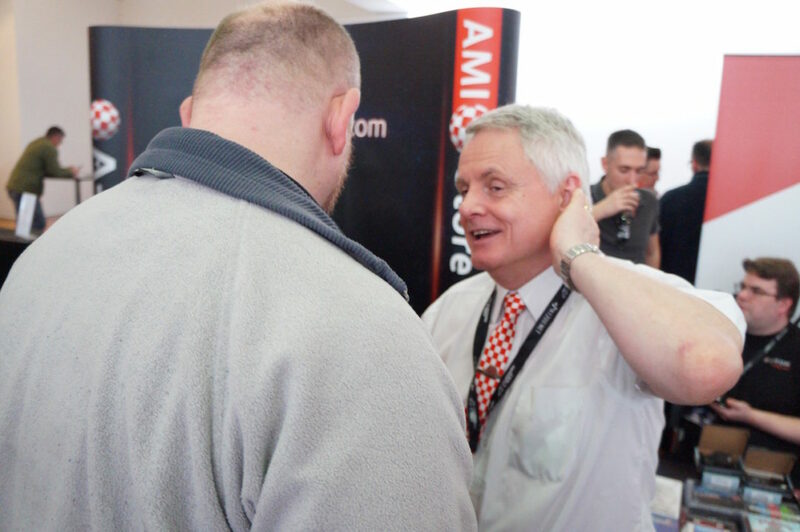 He was really amazed and had just positive comments regarding what the Apollo Team have achieved. 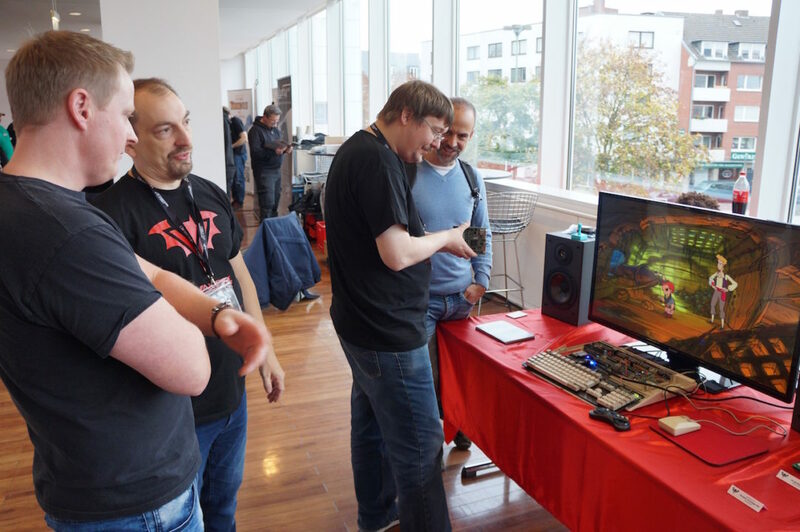 Gunnar also explained a lot about his passion for AmigaOS and how easy it is to code for.. and Jeff Porter agreed on it also. It was really neat to see those two standing there together. 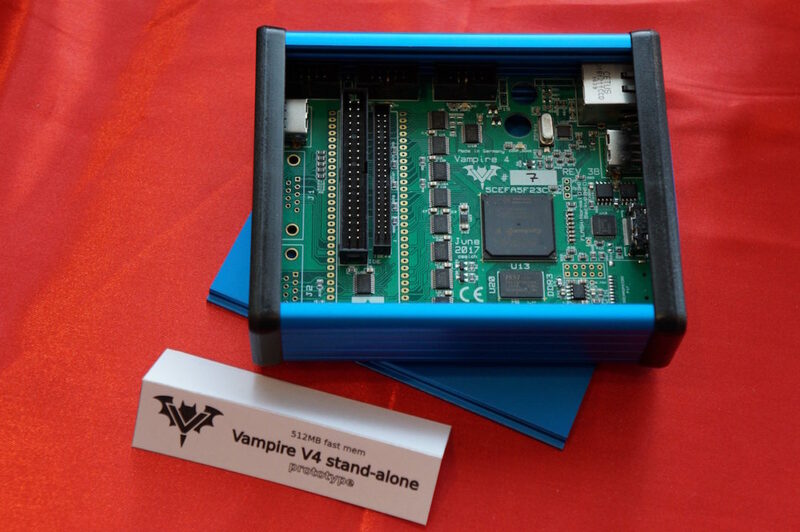 The Apollo Team also showed how Vampire V4 Standalone will look and had several Amiga home computers with Vampire’s installed. It was just amazing seeing Amigas getting the speedboosts that the Vampires gives! Incredible! 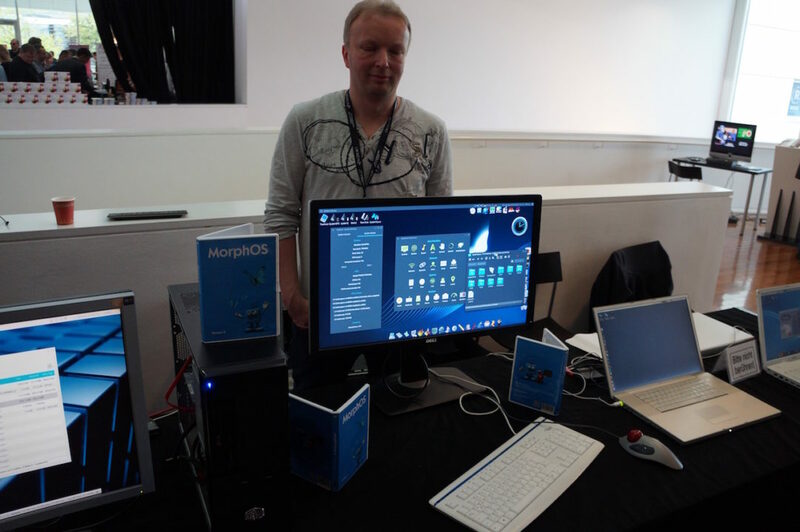 The same goes for the MorphOS Team stand and A-EON stand. But what happened to Hyperion this year? They mentioned about AmigaOS 3.1.4 to me, but nothing about AmigaOS 4. 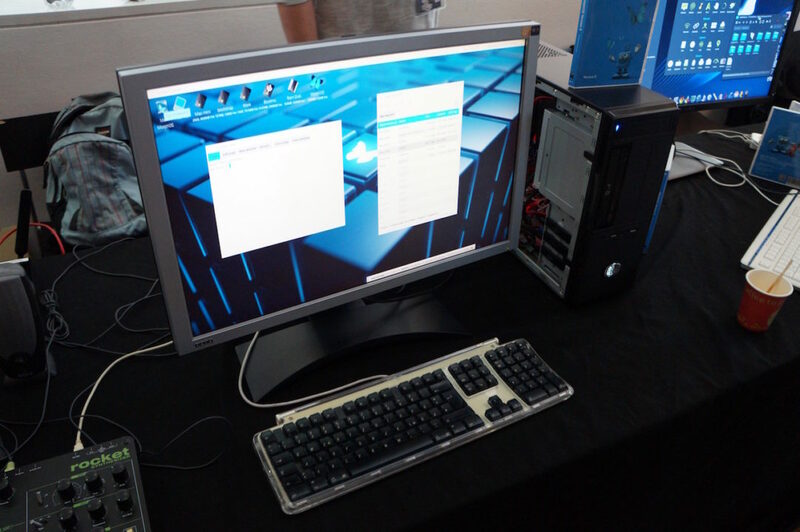 However, A-EON had huge demonstrations of AmigaOne X5000 and A1222 Tabor running 3D animations on AmigaOS 4. 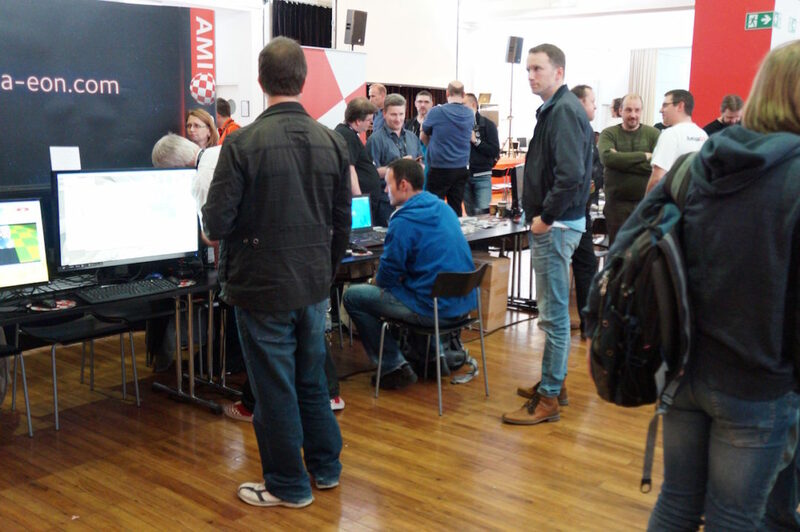 It looked nice and it seemed like many was interested in the next generation AmigaOS. 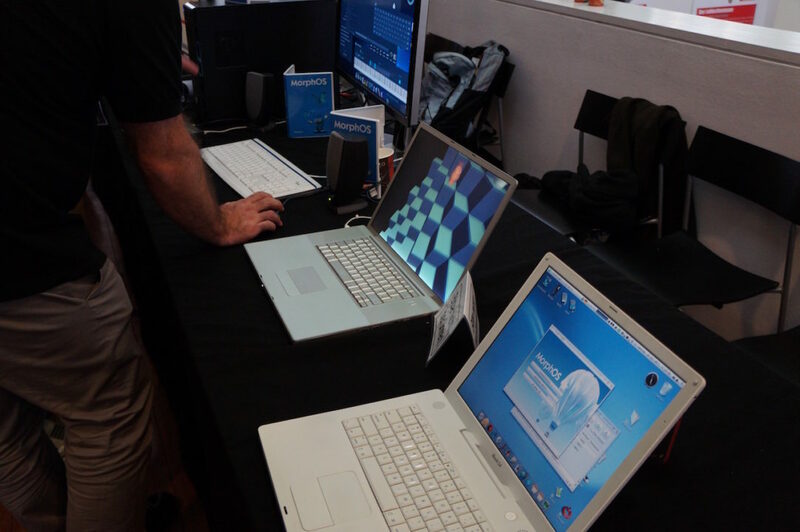 photosource: Distrita – Trevor Dickinson showing of AmigaOS 4 on AmigaOne’s. 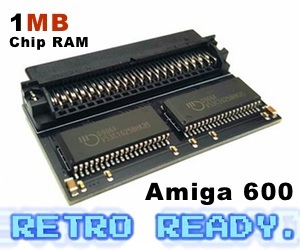 Really nice Amiga hardware that you can get at Amedia Computer France etc! 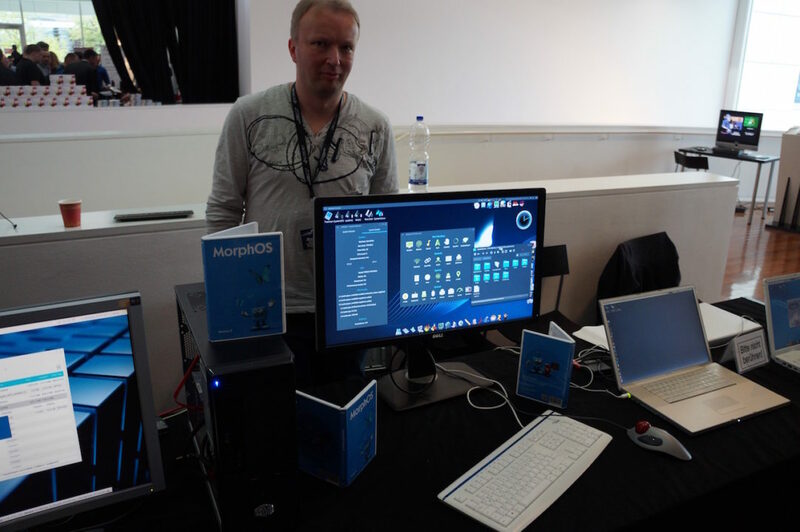 MorphOS Team could show two new types of themes at the show. This was quite interesting. 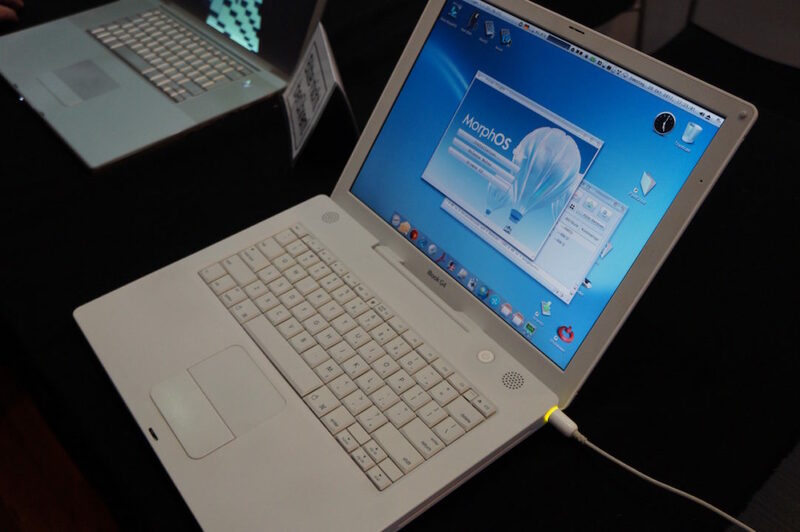 The design is very Windows alike, but the clean design is also a selling point for this AmigaOS compatible operating system. 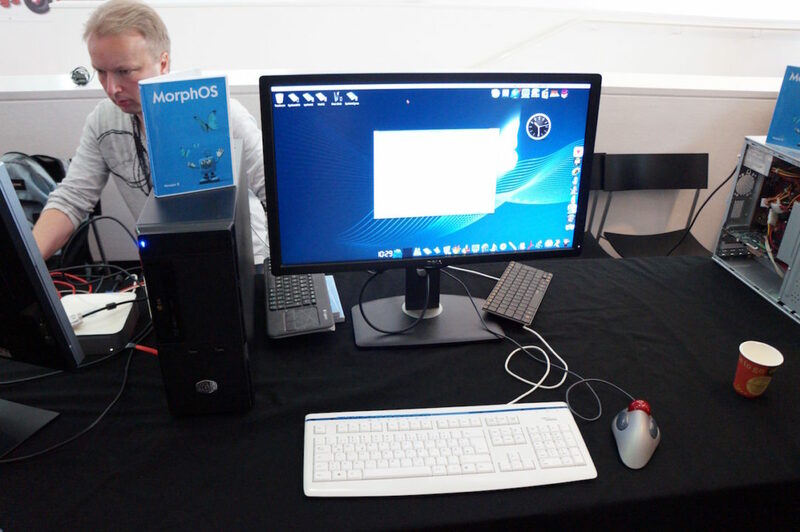 MorphOS 3.10 was also even more revealed. Here at Amiga32, they demonstrated the new calendar feature, new vector icons that can be scaled up and down smoothly and a newer OWB browser. 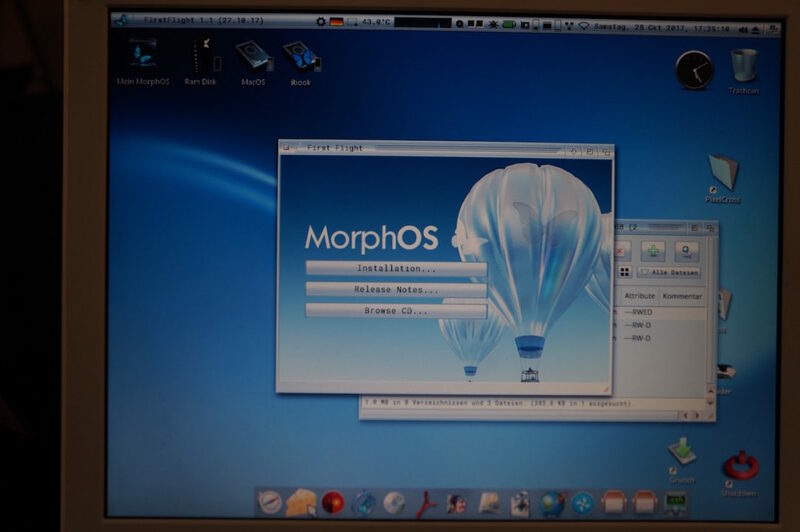 MorphOS 3.10 seems to be almost ready. But a few bugs is going to be fixed before its released to the public. Interesting times ahead for sure. Jens and Individual Computers was also at the event. However, he seems to become more strict and less serviceminded by the years. When asking him questions, it was very unpolite answers back. It doesn’t seem as if service is his key to success. His products is great, but the service is not there. 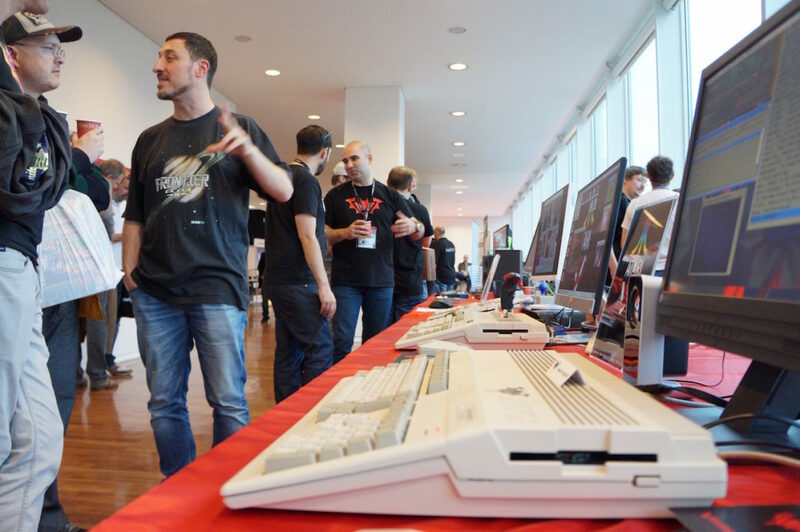 The A1200.net guys which is behind the new and good looking Amiga 1200 casings, was also at the event. 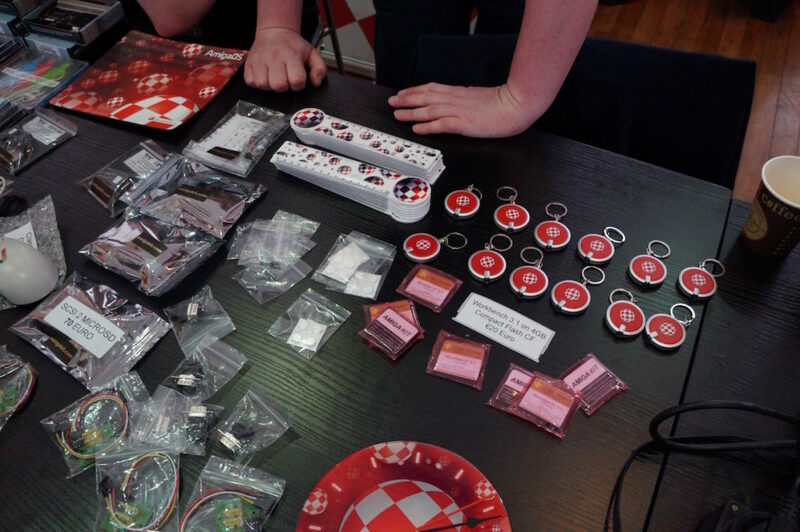 They told me that they were selling the remaining Amiga 1200 casings that they still had left or overproduced. 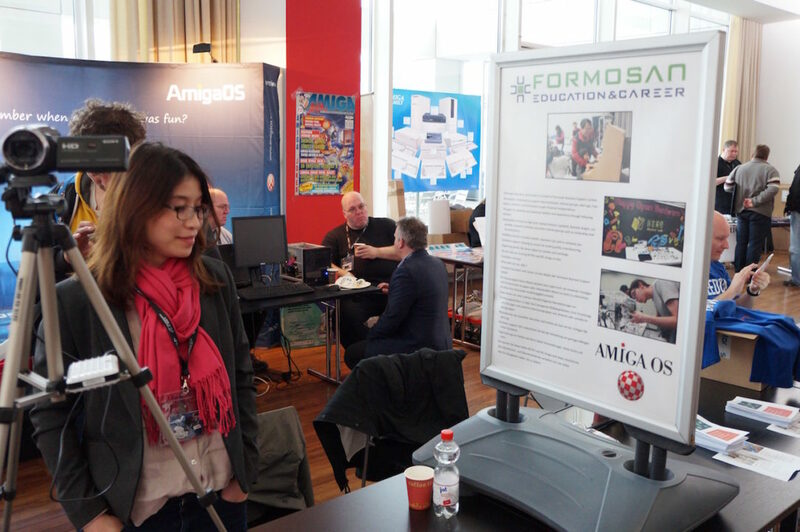 Many people came to their stands all the time, including Amitopia which got one for one of our Amiga 1200’s at the office. 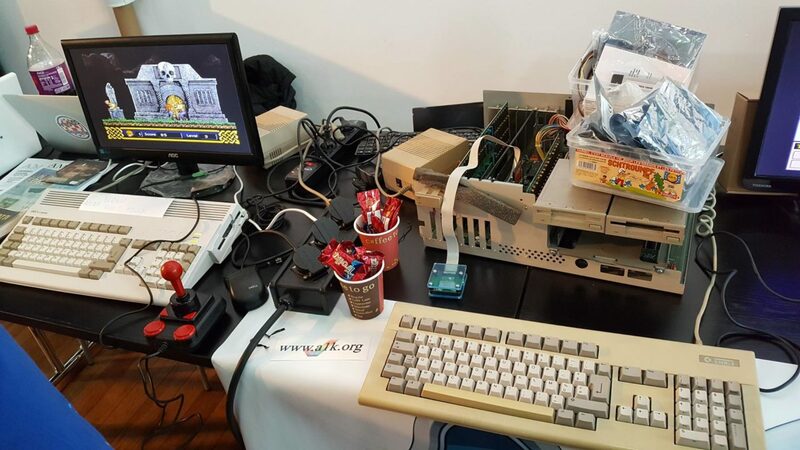 There was also one guy from Taiwan that used Amiga32 for promoting his Amiga usage at schools in Taiwan for learning and teaching home computing. Interesting person and Amitopia will have more about him later for sure. 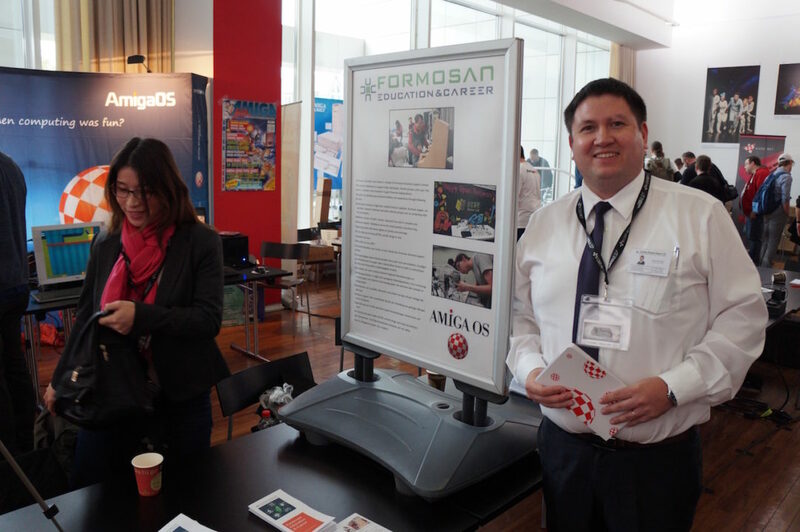 Amitopia wishes his project in Taiwan all the best in the future. We will support you! 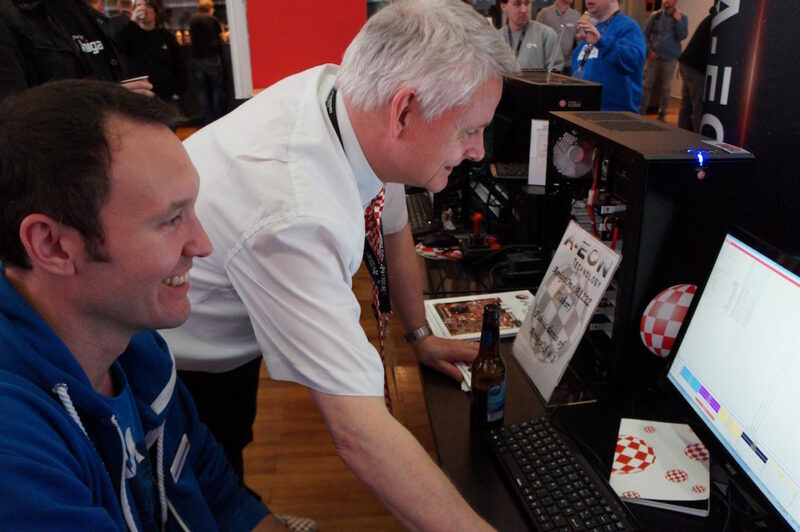 The last biggest Amiga show that I’ve been to was the World Of Amiga event in London in 1999! 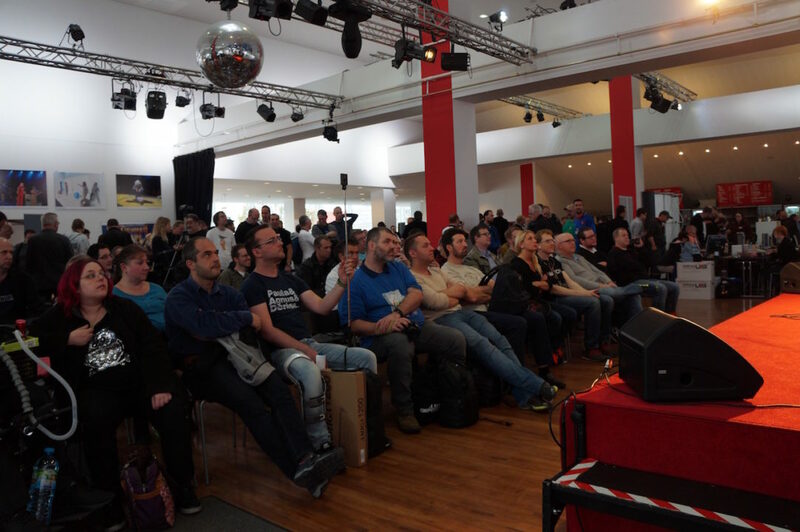 Since then, the various Amiga events that I’ve been to have never been as big and serious as this one. It was a big room, however it did get crowded everywhere. You could find people everywhere. Many were at the stands, while many sat and watched the speeches and performances at the stage. 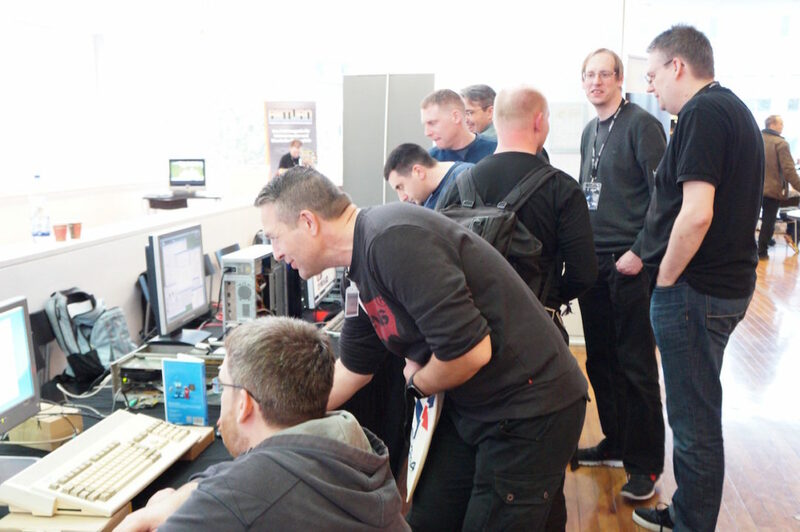 It is simply one of the most popular Amiga events in a very long time. Reason for this might be because of all the positive development that is happening on both Hardware and Software side. 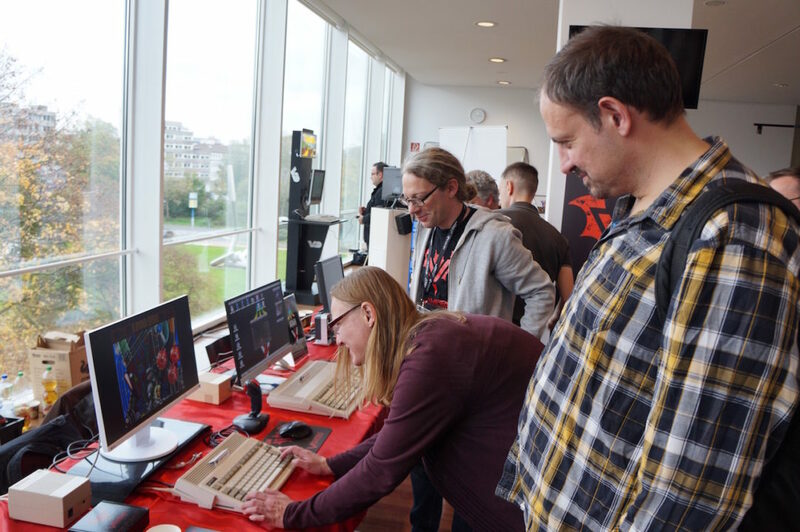 Also many of the conflicts inside the Amiga community is now pretty low, so people doesn’t get scared too much about whats going on in the Amiga field. To have been part of such event is amazing. I loved every second of it! 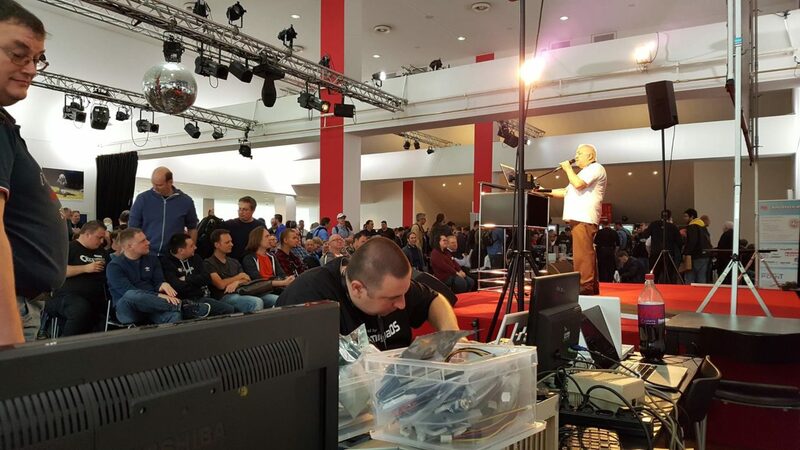 This must have been one of my biggest Amiga event experiences ever. 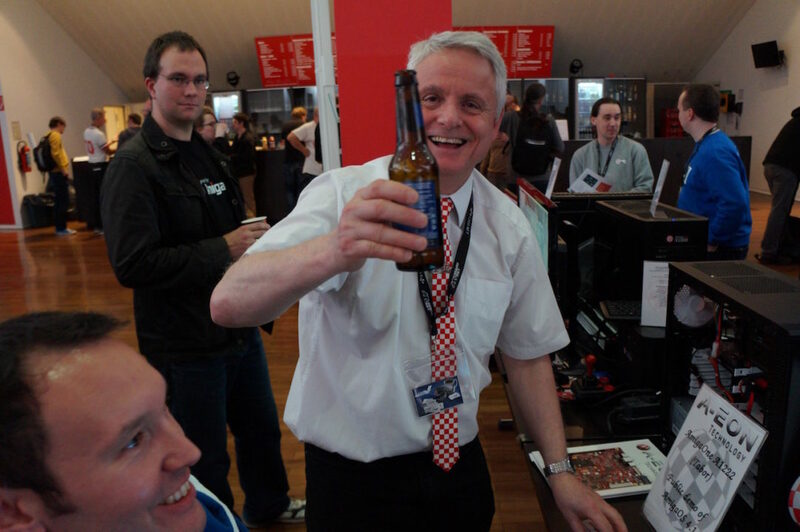 Amiga32 will never be forgotten and I am so thankfull for have met so many nice people at this event. 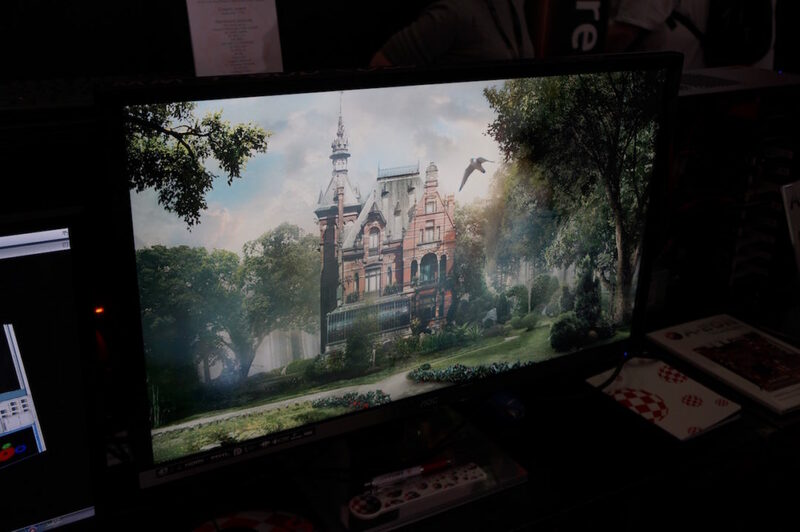 Especially Amedia Computer France, Blue Metal Rose, Vampire team, the Reshoot R developer and Timothy De Groothe from Hyperion. 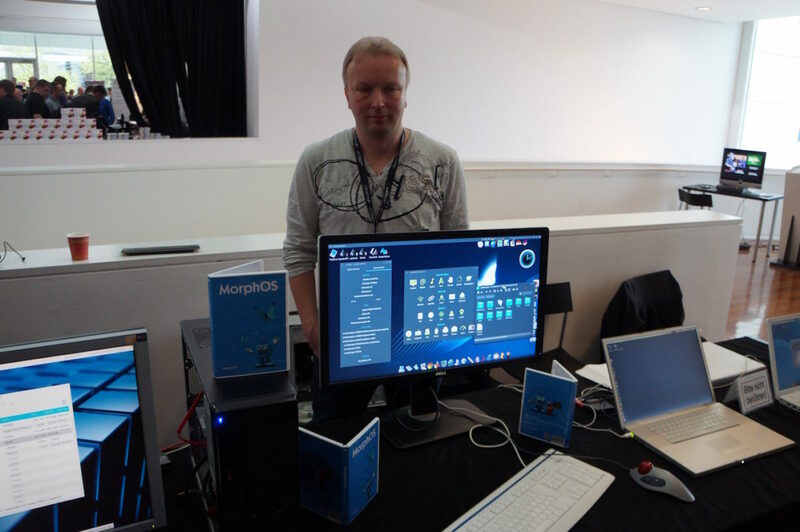 Francois Lionet The Creator of AMOS was also a big positive surprise to meet at the event and the fantastic crew at MorphOS Team. 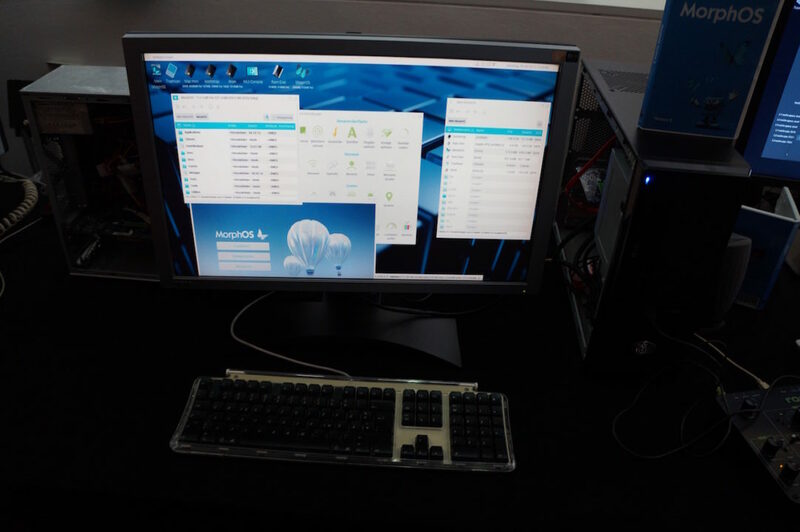 MorphOS 3.10 is for sure huge and when you see it runs so smoothly on the AmigaOne X5000. 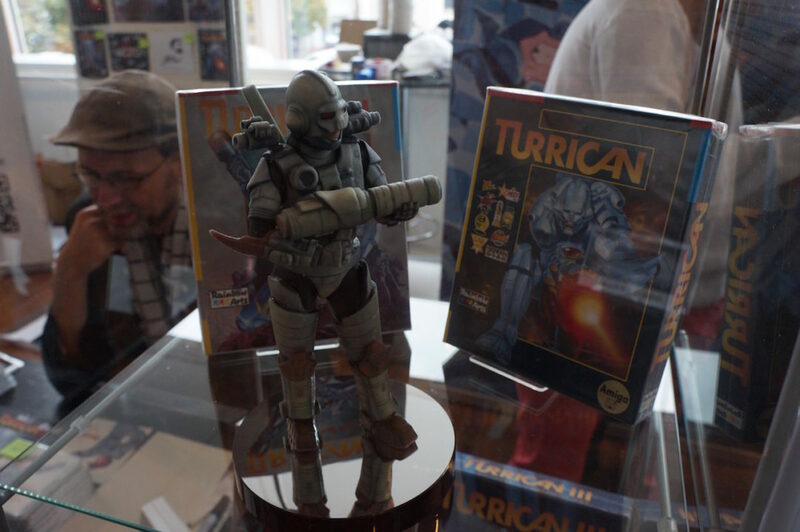 Its really a fantastic showcase. Amigans will have alternatives for sure to choose from. 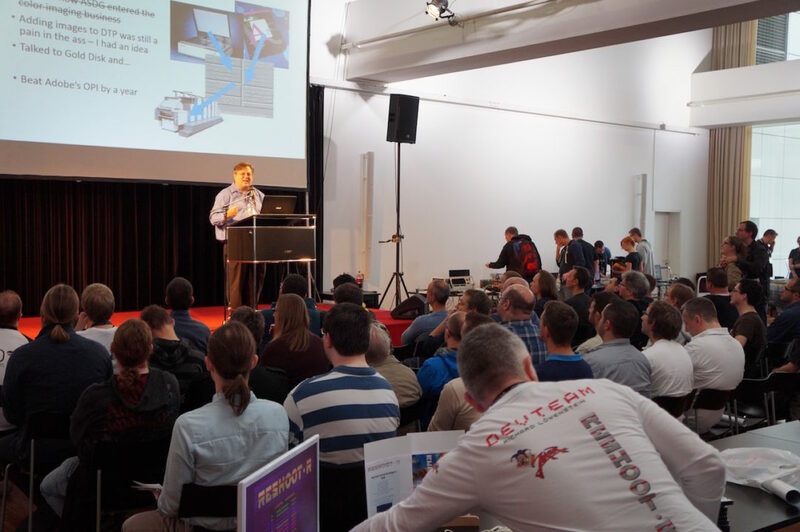 Thanks to the organizers of Amiga32. 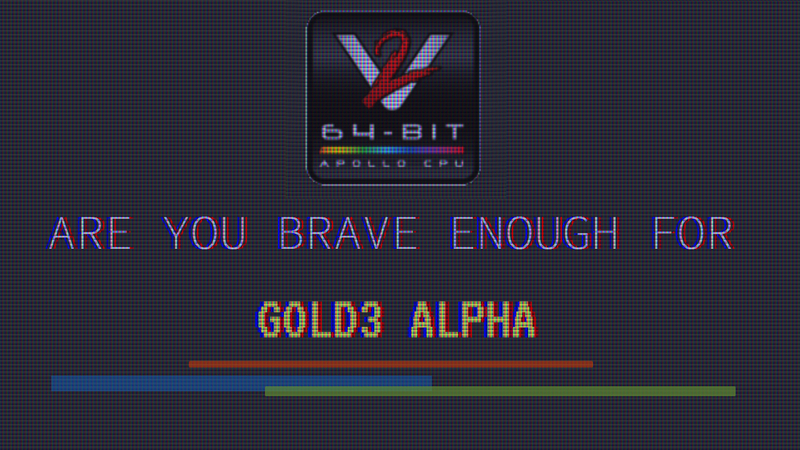 Thanks for giving me a ticket and thanks for one of the best Amiga home computer events ever. 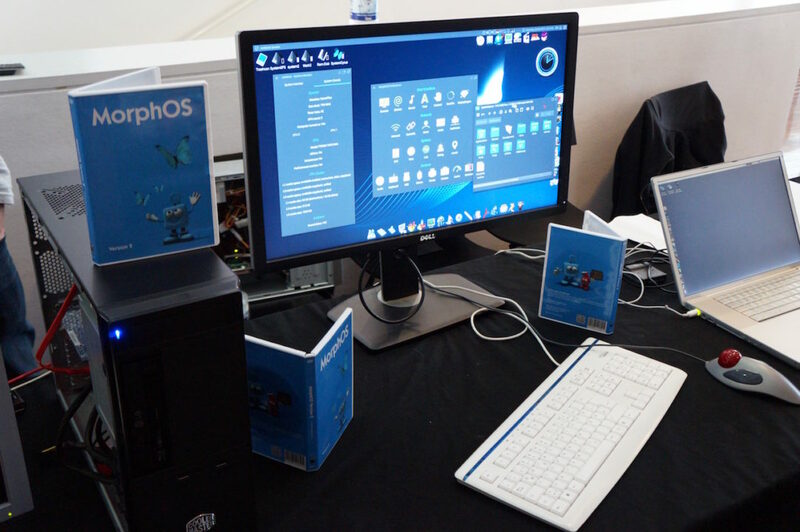 It seems MorphOS ruled this event as well!